I'm deviating from the film related information that is normally up on this blog to show my geek side. I am a great admirer and supporter of this museum - They gratefully accepted a carload of computers that were taking up space in the loft! I'm only sad not to see "several gallons" of mercury being used for the delay lines but that is the march of time, and health and safety. 13 January 2011: A working replica of the first fully operational stored-program computer has been commissioned by the Computer Conservation Society (CCS) in recognition of the achievements of the pioneering computer scientists at Cambridge University in the 1940s, to inform the general public about Britain’s illustrious computer heritage and to inspire future students of engineering and computing. The CCS, a special interest group of the BCS, the Chartered Institute for IT, has a 20-year track record in successfully recreating pioneering computers. The Electronic Delay Storage Automatic Calculator (EDSAC) was a general purpose research tool at Cambridge University and also led directly to the first business computer. It is planned to recreate EDSAC in full public view at The National Museum of Computing at Bletchley Park. The project, which is expected to take three to four years, is being funded by a consortium led by computing entrepreneur, Hermann Hauser. David Hartley, Chairman of CCS and a former president of the BCS, said: "The EDSAC was a brilliant achievement that laid the foundations for general purpose computing and introduced programming methods adopted worldwide and still in use. By recreating EDSAC where the public can watch the process, we aim to enthuse a new generation of computer science and engineering students with the genius of those post-war pioneers at Cambridge University." Professor Andrew Hopper, Head of the Computer Laboratory at Cambridge University, said: "EDSAC set computing standards for academia and commerce. It was so successful that in the nine years following 1949 it was used by Cambridge University researchers in studies such as genetics, meteorology and X-ray crystallography and even helped two researchers win Nobel prizes. EDSAC also led directly to the first commercially applied computer, the LEO, that broke new ground by enabling the catering company J Lyons & Co Ltd to perform payroll calculations in 1953." Kevin Murrell, a director and trustee of The National Museum of Computing, said: "Recreating a fully-functioning EDSAC computer is quite a challenge, but our experience in rebuilding the Colossus computer gives us confidence and insight. The project is fortunate in having the advice and support of Chris Burton who managed the reconstruction of the Manchester Baby, another CCS project. Professor Martin Campbell-Kelly, computer historian at the University of Warwick, will provide an historical and academic perspective for the recreation of EDSAC." The recreation will be as authentic as possible and true to the spirit and technology of the time. Occupying a floor area of 20 square metres, the replica EDSAC is planned to be a highly visible display. The original had over 3000 electronic tubes (or "valves") used for logic, mercury-filled tubes for memory, data input via paper tape and output on a teleprinter. Only the mercury-filled tubes are expected not to be recreated – in compliance with modern safety requirements – and will be substituted with a similar delay line storage technology. EDSAC was based on the ideas of John von Neumann and others who in 1945 suggested that the future of computing lay in computers which could store sets of instructions (programs) as well as data. Its 3000+ vacuum tubes used as logic were arranged on 12 racks. It performed 650 instructions per second. 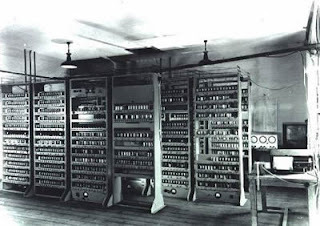 EDSAC ran its first program on 6 May 1949 and soon began nine years of regular service ending in July 1958 when it was dismantled to enable the re-use of precious space. By then it had been superseded by the faster, more reliable and much larger EDSAC 2. If you're in the Milton Keynes area then drop into Bletchley Park and see the museum's great collection of computers (with some you can get your hands dirty using). It's open Thurs & Sat 1-4pm & bank holidays. Guided tour Tues pm (book in morning). Groups other times by arrangement.